Derby claimed a second away win in as many games as they beat 10-man Reading in the Championship. Tom Ince scored the game's only goal midway through the second half after Chris Martin threaded a ball through the home defence. Reading striker Orlando Sa was shown a straight red card for an incident off the ball with Jason Shackell on the stroke of half-time. The defeat ends Reading's seven-game unbeaten run in all competitions. Paul Clement's Derby side, who failed to win their first five league games before a 2-1 away win at Preston on Saturday, were made to work for the three points. Reading, full of confidence after a resounding 5-1 home win against Ipswich on Friday, had the better of the early chances. Nick Blackman and Oliver Norwood went closest before half-time as Scott Carson was forced to tip long-range efforts behind. Derby were limited to a header from Richard Keogh, which was easily held by Jonathan Bond. But, moments before the break, Sa was dismissed as he tangled with Shackell after the ball was cleared. The Portuguese striker, who netted a hat-trick against Ipswich, appeared to headbutt Shackell and referee Andy Davies had no hesitation in sending him off. The numerical advantage took time to tell for the visitors until Ince found space from Martin's precise pass. Reading pushed hard for an equaliser, but the visitors' disciplined shape off the ball meant substitute Hal Robson-Kanu's tame header over from a corner and Chris Gunter's lashed volley was the closest they came. "I haven't seen the red card. One or two people said it was a bit silly, others said it was a bit soft. Until I actually get a look at it again, it's hard to judge. "It certainly changed the game as 11 against 11, one good team was trying to win it, the other half-decent team was trying to make sure it got a point from the game. "It's harsh to judge us on tonight as we lost against a good team, who will certainly finish in the top six, and we handled them well." "A brilliant response from the players after a difficult start to the season. We hadn't been playing that badly before, but we just weren't picking up the results. "The sending off is a big turning point, it changed everything. I hadn't seen it, but at half-time Jason Shackell said the head was put on to him in a coming together and the referee's seen it and quickly made the decision. "You come to a place full of confidence after a big home win and we had to be at our best to control the attacking threat. We had to be patient as playing against 10 men isn't easy." Match ends, Reading 0, Derby County 1. Second Half ends, Reading 0, Derby County 1. Attempt missed. Chris Gunter (Reading) left footed shot from the centre of the box is high and wide to the right. Assisted by Garath McCleary with a through ball. Corner, Derby County. Conceded by Hal Robson-Kanu. Attempt missed. Hal Robson-Kanu (Reading) header from the centre of the box is too high. Assisted by Oliver Norwood with a cross following a corner. Corner, Reading. Conceded by Craig Forsyth. Attempt blocked. Danny Williams (Reading) right footed shot from outside the box is blocked. Assisted by Hal Robson-Kanu. Corner, Reading. Conceded by Jason Shackell. Attempt blocked. Garath McCleary (Reading) right footed shot from outside the box is blocked. Assisted by Oliver Norwood. Substitution, Reading. Garath McCleary replaces Aaron Tshibola. Attempt missed. Craig Forsyth (Derby County) left footed shot from the left side of the box is just a bit too high. Assisted by Bradley Johnson. Attempt missed. Nick Blackman (Reading) left footed shot from outside the box is too high from a direct free kick. Foul by Jamie Hanson (Derby County). Substitution, Derby County. Jamie Hanson replaces Jacob Butterfield. Offside, Derby County. Richard Keogh tries a through ball, but Darren Bent is caught offside. Attempt missed. Oliver Norwood (Reading) right footed shot from outside the box misses to the left. Assisted by Danny Williams. Goal! Reading 0, Derby County 1. 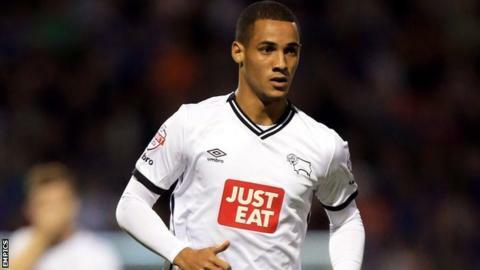 Tom Ince (Derby County) left footed shot from the centre of the box to the bottom right corner. Assisted by Chris Martin. Substitution, Reading. Hal Robson-Kanu replaces Stephen Quinn. Substitution, Reading. Danny Williams replaces Matej Vydra. Substitution, Derby County. Darren Bent replaces Jeff Hendrick. Corner, Derby County. Conceded by Chris Gunter. Attempt missed. Bradley Johnson (Derby County) left footed shot from outside the box is high and wide to the left. Attempt missed. Nick Blackman (Reading) left footed shot from outside the box is close, but misses to the right. Assisted by Oliver Norwood. Attempt missed. Jeff Hendrick (Derby County) right footed shot from outside the box misses to the right.